SSI’s Disc Diffusers with PTFE coated membrane is the top choice of pharmaceutical wastewater treatment plants around the world. 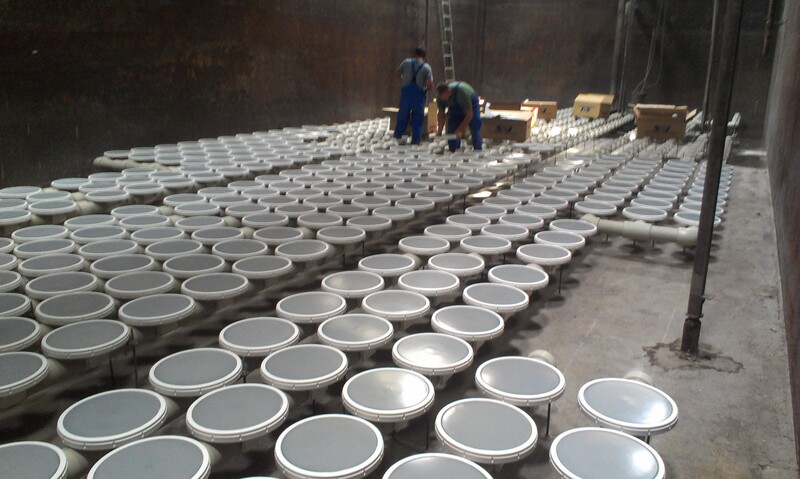 With installations in China, Ireland, Philippines, India, and Hungary just to name a few, it is the best option when treating pharmaceutical wastewater. The PTFE coated membrane is chemical and solvent resistant, which is a must have when treating pharmaceutical wastewater due to the high levels of chemicals within the water that could cause degradation to a normal membrane. An installation for a pharmaceutical wastewater treatment plant in Hungary decided to use SSI’s 12” disc diffuser with PTFE coated membrane. 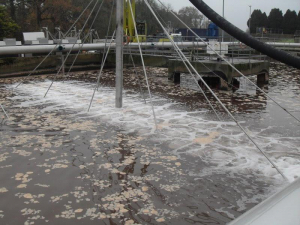 The PTFE coated membrane provided a strong resistance to the harsh chemicals in the pharmaceutical wastewater. A picture of the installation can be seen below. SSI’s 12” disc diffusers with PTFE coated membrane were compared side by side with a competitor’s 9” disc diffuser with EPDM membrane and the results spoke for themselves. The competitor’s membrane decreased in thickness by 14.58% and had stretched by 6.62%, whereas SSI’s PTFE coated membrane only decreased in thickness by 1.39% and had stretched by 2.97% resulting in a significantly more efficient operation. 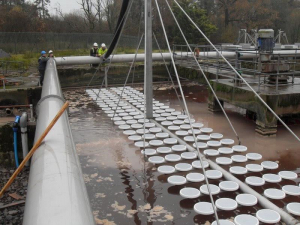 It was because of these tests, that the pharmaceutical wastewater treatment plant in Hungary had decided to use SSI’s diffusers. SSI’s PTFE coated membrane offers a longer lifespan than traditional EPDM membranes in industrial applications such as this. The PTFE coating creates a strong barrier between the harsh chemicals and membrane, which prevents chemicals from seeping in and breaking down the membrane, thus creating a longer life span. For industrial plants, draining a basin could mean shutting down their entire operation, which isn’t an option. 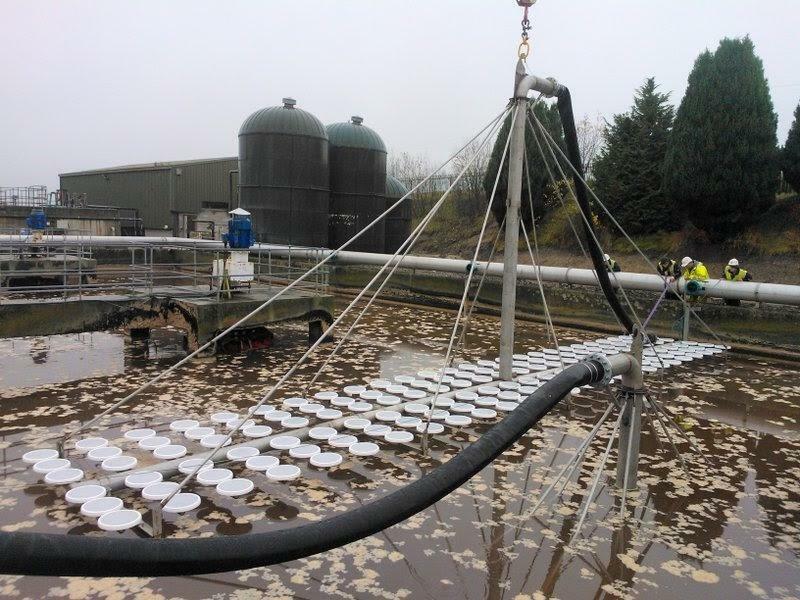 This is why retrievable systems work well for scenarios such as this because they allow the entire aeration grid to be lifted out for inspection without dewatering the tank, which can be seen in the pictures below.